a publication of the National Court Reporters Association, and is reprinted on raintreecounty.com with their permission. Sometime in early 1992 I got a phone call from retired reporter Morris Miller of Westbury, N.Y., asking if I'd be willing to try to decipher the notes of a deceased Gregg writer. As he now remembers, it was Arlene Stock, editor of The Transcript, who had recommended him. "I could never have transcribed those notes," he told me. But, perhaps remembering the "Other People's Notes" articles I'd written for the National Shorthand Reporter back in the '70s, he thought I might be interested. I told Morris I really wasn't; that I was too busy in my "retirement." Would I at least talk to the man who wanted the job done, Laurence (Larry) Lockridge, professor of Romantic literature at New York University? I agreed, saying I might be able to find somebody else for him. Dr. Lockridge is a persuasive talker. He told me he was writing a biography of his father, Ross Lockridge Jr., whose tragic death came shortly after the publication of his best-selling novel Raintree County. I agreed to take a look at the notes - and I was hooked. The elder Lockridge had left a number of papers - journals, notebooks, random notes - all written in Gregg shorthand, the version we call pre-Anniversary. Like most Gregg reporters, I myself write Anniversary, though I'm familiar with the earlier, shorter system. (Each new version was longer than the one before.) Martin J. Dupraw, a national speed contest champion back in the '20s, uses pre-Anniversary in his freelance reporting in White Plains, N.Y., where he's much in demand by the lawyers. By the way, Martin called me while this article was in preparation. I'd written to ask him if he minded my mentioning his age. "Not at all," he said. "In fact, today is my 89th birthday. I may be the oldest active reporter in the country. I work every day, though I no longer take all-day depositions. Half a day is enough. When I'm not writing shorthand I'm banging out transcript on my trusty manual typewriter." I suppose we all develop quirks in our shorthand, especially when years elapse after we've learned theory. One I hadn't met before: In forming plurals, the writer often doubled up on his s's. For example, the plural of cat he probably would have spelled kats(e)s.
Next to good notes, I suppose context is the transcriber's best friend. And repetition can be a wonderful help. (In a court case, an impenetrable passage on direct can come clean when attacked on cross and redirect examination.) There was very little contextual help and almost no repetition in these mostly brief entries. Actually, my main problem was the dimness of the notes. I fussed over the fact that I didn't have the original notes, which I assumed would be much easier to read. But Dr. Lockridge didn't want to trust them to the mails. And besides, he wrote me later, "You would have had much rougher going with the originals, even with a magnifying glass! These pencil jottings are so very dim and small that your eyes would have given out. The Xerox machine that I used both enlarged the passages and made them considerably darker. I know that any photographic transfer in theory loses some data - but in some instances it was difficult to see that there were any pencil markings at all until the Xerox disclosed them." For the benefit of others who might venture into this field, I'll mention our financial arrangements. The client should be told that this kind of transcription commands a premium fee, and well it should. On most similar projects I'd previously undertaken I charged by the page. I didn't expect to make any money at it; I did it more as a favor to the judicial system. (In cases for the Middlesex County [Massachusetts] Superior Court I charged twice the statutory page rate - the transcription was so slow going that I doubt if I netted more than 25 cents an hour for my labors.) Dr. Lockridge and I agreed that an hourly rate would be best. I suggested $10. "No," he said, "I refuse to pay anything less than $25." I let him talk me into it, and I ended up with a tidy sum - $1,400, as I remember. Finally I had the job done except for one last batch of notes. It showed up on January 21, 1993, a few minutes after I arrived home from the Boston hospital where I'd had surgery for lung cancer, with about a third of my right lung removed. (As a lifelong nonsmoker, I still think Nature played a dirty trick on me.) "Let's finish up the job," I told my husband. 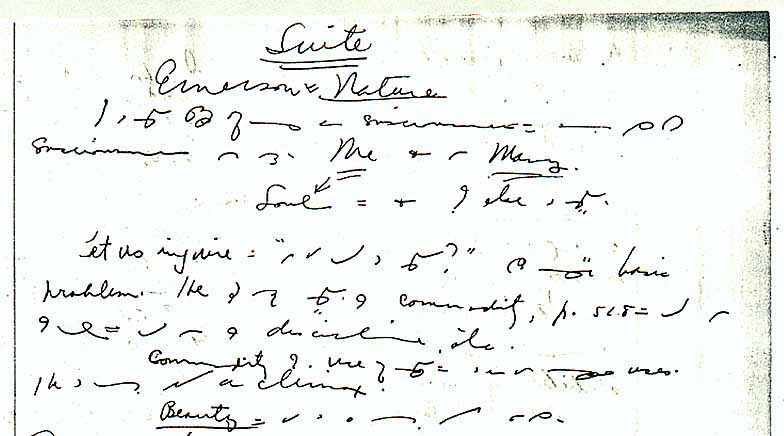 I pored over the notes, rewrote them in my own shorthand, then dictated to him as he keyed in the sentences on the computer. I tell this not to show how noble I am - I welcomed the distraction to keep from thinking about my discomfort. Larry Lockridge's own book, Shade of the Raintree, subtitled The Life and Death of Ross Lockridge Jr., came out in hardcover in April 1994 (Viking Penguin. $27.95). The author tells me that a paperback edition will be in bookstores in November 1995. The reviews of the biography that I saw were good. In fact, Larry Lockridge says that the reviews have been almost universally enthusiastic: "Viking Penguin tells me they haven't had a book on their list so positively reviewed in years. Still not a negative review." The Boston Globe said it "is destined to become an American classic." I probably wouldn't qualify as impartial, but I found Shade of the Raintree fascinating. It proves that Ross Lockridge wasn't the only writer in the family. The son brings the father to life. I strongly recommend this gripping biography. Ross Lockridge died in 1948, the year of his book's publication. Larry Lockridge told me at the outset that his father had tragically died at a very young age, but not until I read the biography did I know what had actually happened. Sometime in the late evening of March 6, 1948, at his home in Bloomington, Ind., as he sat in his car in the garage, having attached a vacuum cleaner hose to the exhaust, Ross Lockridge turned on the engine and suffocated from the fumes. He was only 33. As to exactly what went wrong, most of the problems came with getting Raintree County into print and difficulties that arose shortly thereafter. The author had been in a state of clinical depression even before the book came out, and quarrels with the Book of the Month Club and a contract dispute with his publisher, Houghton Mifflin, over splitting up award money from a Metro Goldwyn Mayer contest exacerbated the situation - and his depression. The author wasn't happy over some cuts made in the book and the rewriting he had to do. When the book finally came out, some of the reviews were unfavorable; this he took very hard. He had money problems, and there was pressure on him to start another book. He became ill and more and more depressed. Larry Lockridge wrote in Shade of the Raintree, "He wasn't depressed because he couldn't get a second novel going; rather, he couldn't get a second novel going because he was depressed." It's hard to avoid the conclusion that the book killed the author. The news of Ross Lockridge's suicide "came simultaneously with the Herald Tribune's announcement that Raintree County was now the number one national bestseller," the son wrote in Shade of the Raintree. Getting back to the shorthand and my contribution, it was interesting to me to see which passages I'd labored over found their way into the biography. In one of them, probably written shortly before the suicide, Ross Lockridge wrote, "One might as well speak out, and bravely, about one's book and other things - one cannot possibly commit any graver errors than one has already imagined." In his "Notes and Acknowledgments" in the biography, Larry Lockridge wrote that he was much indebted to me. "[She] was able to decode a good percentage of my father's shorthand in various manuscripts and book margins." Earlier in the book, with no names mentioned, he wrote, "[My father] was a state champ at Gregg shorthand, the obsolete 1919 version. His use of it became idiosyncratic over the years. I had to round up a world-class decoder to recover some dreams, notes, and marginalia." Retired reporter-editor Mary Louise Gilman of Hanover, Mass., now  constructs acrostic puzzles and words articles for several publications. To another sample of the Gregg shorthand of Ross Lockridge, Jr.